Ukrainian activist Oleg Sentsov is currently imprisoned in Russia under false pretenses after voicing criticism on Russia’s 2014 illegal annexation of Crimea and human rights violations against the indigenous Crimean Tatars there. Former Polish President and Nobel Laureate Lech Walesa, who campaigned for human rights and political freedoms under the Soviet Union, has announced he nominated Sentsov for the Nobel Peace Prize. Nominations are usually kept from the public for 50 years after their submission, making Walesa’s announcement a surprising but welcome recognition of the injustices endured by Crimean Tatars and others under Russian occupation. Lech Walesa, the former Polish president and Nobel laureate, said he has nominated Ukrainian filmmaker Oleh Sentsov, who is imprisoned in Russia, for the Nobel Peace Prize. Walesa told RFE/RL’s Ukrainian Service that he sees similarities between Sentsov’s situation and his own in the 1980s, when he was imprisoned by Polish authorities for his work as the leader of the Solidarity trade union. “I was also in a difficult situation,” Walesa said in an interview published on August 29. “I also struggled. This award (Nobel Peace Prize) helped me, as well as Poland, in regaining freedom. 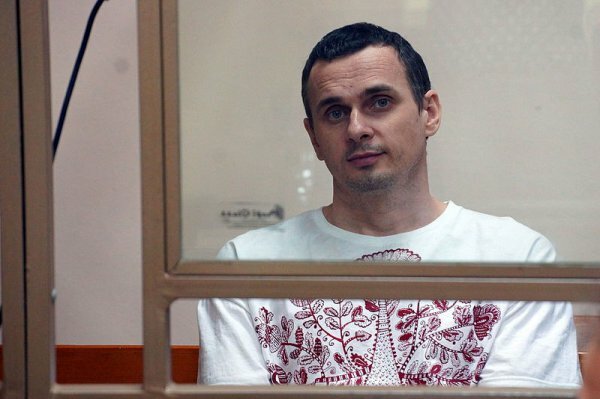 A filmmaker who was a vocal opponent of Russia’s 2014 annexation of Crimea, Sentsov was arrested in Crimea that year and convicted the following year by a Russian court of planning to commit terrorist acts. He was sentenced to 20 years in prison. His plight has drawn international support and calls from Western governments for him to be released. He has been on hunger strike in a remote Russian prison since May 14. “It is good that there are people like you. It gives us hope that the world will improve -- so persevere, no matter what wrongs meet you, persevere, because you give the world an example of the right way to fight,” Walesa said. Walesa also said the West was not doing enough to help defend Ukraine’s sovereignty against Russia. “Europe and the world are lacking in solidarity. We did not have plans for these times. This disunity, this discord in Europe and in the world, all this causes us to not address issues such as Ukraine,” he said. The Norwegian Nobel Committee each year receives several hundred nominations for the Peace Prize. Generally, the names of nominees are not released to the public for 50 years after their submission.